The ship's boarding team practices their close-quarters combat skills while the ship's Master-at-Arms offers "encouragement". 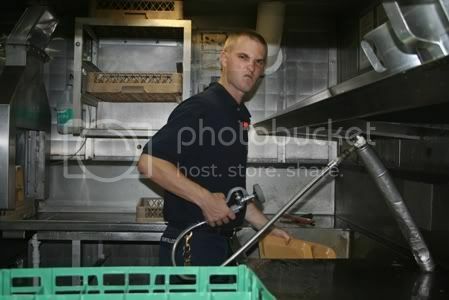 A Food Service Attendant "enjoys" his duty in the scullery. CG Division stands tall for a personnel inspection at morning quarters. 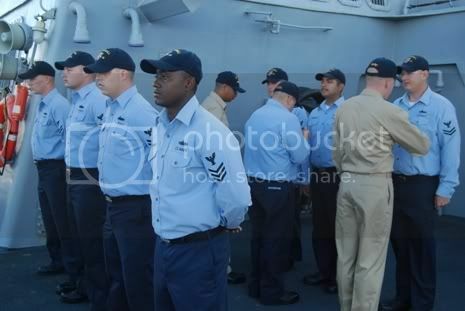 VBSS is near and dear to my heart. I wish your MIO team the very best. Best advice I ever received: "Think Tactical, Act Casual". +300 boardings later...it still works. Shoot straight and stay safe. I was going to ask about the small arms on board. Their appears to be a couple different battle rifles. I see a couple southpaws are in the team. Are the men assigned their own weps so the lefties don't have brass skipping over their foreheads. What about hand guns? Beretta 9's or hopefully something with a little more punch like a Sig.40. I assume you have something like Mossbergs 500s for interdiction inspections. We had M-14s (most excellent) M-60s and 1911s(also most excellent). Never did understand the switch to the 9mm. We do have a mishmash of small arms. 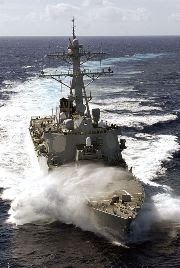 In general, the Navy is swapping most of the M14s out with M16s, though each ship will have to keep a couple of M14s to be able to fire shotlines for replenishment-at-sea. 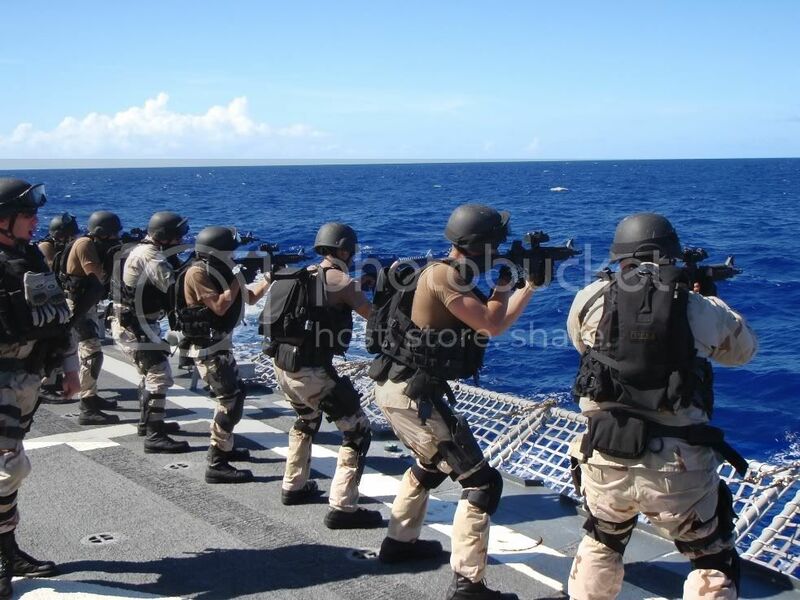 Ship's with boarding teams have the Mk18, which is a weapon NSWC Crane cobbled together from M16 lower receivers and the parts and pieces they had on the shelf. I've heard a rumor they're going to be replaced also, but I haven't seen anything official yet. Finally, the M1911 pistols have all been replaced with the M9s, so now we have to train all our armed watches to shoot everything twice (at least). The 9mm are called Europellets for a reason. The do make some good defensive rounds for it that improve the ballistics but in FMJ they are not much good but for plunking. There was hope the Mil would put the M-14s up for sale to the public like they did the Garands but they are being used in Iraq and Afghanistan. I haven't checked lately to see where the program is at. Thanks for the info XO. I think it was said earlier that there was only 1 master-at-arms aboard. Where is the boarding team drawn from then? I am not a navy guy, so yeah this most likely sounds like a dumb question.